A party-packed schedule can leave even the most well-tended skin looking a little lacklustre. For a complexion that glows, here’s our radiance-boosting tips to ensure your skin shimmers and sheens this festive season. For red carpet-ready skin, A-listers often book a full facial two days before their event and then a mini intensive treatment to top up on the day, ensuring their skin radiates a lit-from-within glow. For a pre-party treatment like no other, our diagnostic facial (90 minutes) contains two prescribed techniques (which can include oxygen therapy, high frequency, microdermabrasion, pharmaceutical grade peels, microneedling and radio frequency) and will be expertly customised to ensure you achieve optimum results. In the run-up to the party a gentle peel not only removes dull skin cells to instantly brighten the complexion but more importantly improves moisture levels and helps to strengthen the skin’s moisture barrier while plumping its texture. Combine this with light therapy or radiofrequency and you’ll see energy building slowing in the skin cells, peaking two to three days after the treatment, at which point you’ll see true visible results. We’ve treated several VIP guests with radiofrequency, focusing on lifting, particularly the brows and jaw area, right before red-carpet events. The skin instantly looks incredibly taut and there’s no downtime. At Gazelli House, our wellbeing space and spa in London’s South Kensington, we use a radiofrequency device that combines LED therapy and a vacuum suction cup to effectively drain fluid, plump lines and define facial contours. If time allows for a follow up or you have only 30 minutes to spare, book in for a 30-minute diagnostic facial treatment which will include one prescribed technique. Again, our experts will curate the treatment to meet your skin’s needs on that day. 1. For a quick way to get an instantaneous glow, try massaging the skin with a good face serum. With a high concentration of actives, serums instantly revive the skin while the kneading action brings all the nutrients to the surface. You could also mix a drop of serum to your foundation for an added touch of radiance. We love our Ultimate Firming Serum, enriched with our signature White Oil. 2. Another easy way to revive tired skin at home is to use ice cubes, which work to boost circulation, reduce puffiness and calm inflammation. Keep them moving over the skin to ensure the cold doesn’t burn. We like to keep a batch of beauty ice with added drops of aloe vera in the freezer. The results are instant. 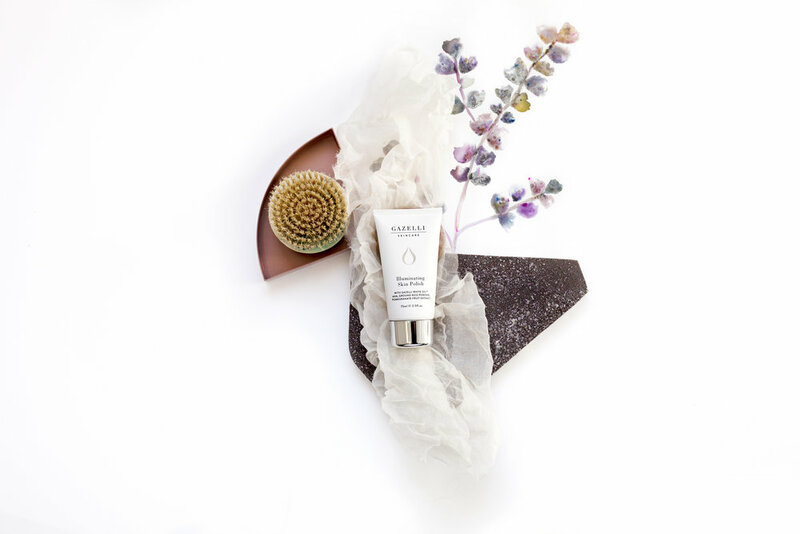 For healthy, dewy radiance that lasts far beyond the festive season, it’s all about exfoliation and hydration. We recommend Gazelli Illuminating Perfecting Skin Polish to remove dull, dry skin cells followed by our Ultra Nourishing Saviour Mask to drench skin in moisture. For great skin, incorporate these into your skincare routine at least once a week. We offer all our radiance-boosting, non-invasive treatments at Gazelli House, our sanctuary of wellbeing in South Kensington, London, with a spa offering our acclaimed diagnostic facials. Click here to find out more or email bookings@gazelli.co.uk if you have any questions or would like further information.